By the special grace of God, we took off for Maiduguri on the 15th of October to bring much needed food and household items to the displaced people in Maiduguri. Rev. Amos Dwala (also a member of the Disaster Team) and I passed through the towns of Potuskum, Damaturu, Beneshek and many others on our way to the capitol of Borno State. Indeed, the Boko Haram has done much damage to these towns, and many places remain desolated. As we traveled, we were moving with fear and pains in our hearts seeing the kind of damage that has been done. One positive thing we noticed on the road is that the military are patrolling and stationed in these dangerous zones leading to Maiduguri. When we arrived on Thursday, we witnessed three bomb blasts, one in Moloi (a section of Maiduguri) at a Mosque. More than 50 people were killed, and the next day another bomb blast at Ajalari killed 20 more. On Saturday, the 17th, another bomb was exploded at Ummurari where 8 other people lost their lives. On Sunday, a lady suicide bomber was about to enter Maimalari Army Barracks but was shot dead by the soldiers. The people in Maiduguri are always living in fear of the unknown, but despite all these violent things happening, God is still in control. We distributed food and household items to 544 households. 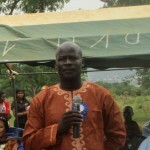 The items included were: rice, blankets, mosquito netting, cooking oil, detergent, salt, Vaseline, maggi cubes and sugar. 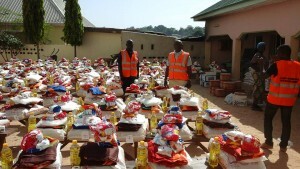 The IDPs (Internally Displaced Persons) were happy to receive this kind of help. They said this was the best assistance they had received, so far. Those that are living in the camps in and around Maiduguri are 7,572 in number, while the people living with host families and rented houses are over 3,ooo. These are the people we gave out assistance to because the Borno government is taking care of the ones in the camps. 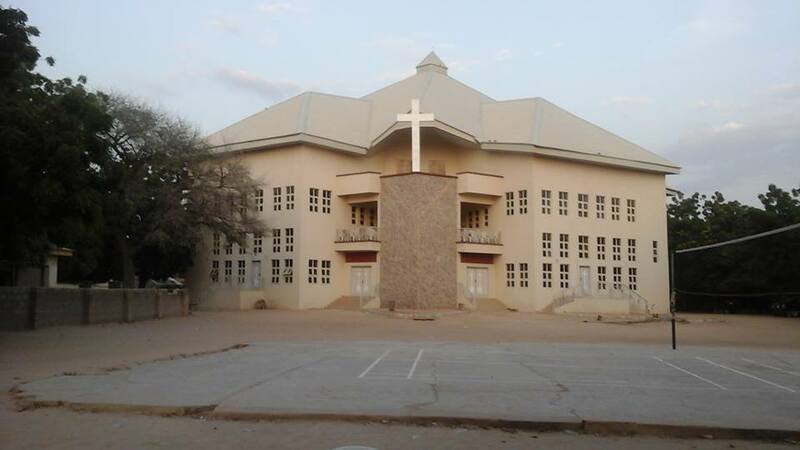 After the distribution, I worshipped in my former church EYN Maiduguri which was burnt by the insurgents in July of 2009, when I served as pastor there. We rebuild it in two years and the final improvements were completed this year. Worshippers that day were up to 3,700 in number. What a great God we are serving, in him we put our trust. On Monday 19th of October, we returned safely back to Jos and the EYN headquarters. This entry was posted in Nigeria and tagged Boko Haram, Ekklesiyar Yan’uwa a Nigeria, EYN, nigeria crisis, Peace, prayer by Roxane Hill. Bookmark the permalink.